Whether this is your first character or your fiftieth, if you’re leveling a character in World of Warcraft, heirlooms are a key part of the experience. 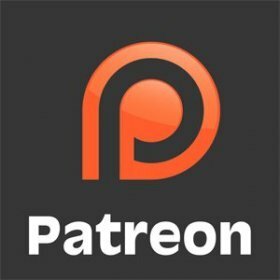 This isn’t to say that heirlooms are necessary for leveling — many of us have leveled without them through the years — but on the long road from level 1 to level 100, heirlooms can speed up the process significantly… and help you spend less time hunting for gear and more time playing the game. Who wouldn’t want that? Primarily, the benefit of heirloom items is that many of them provide a boost to experience gained when wearing them, which means you’ll level up faster. However, that’s not their only benefit: unlike most in-game items which have a fixed item level, heirloom items level up with your character, growing more powerful as you grow more powerful (within certain limits). 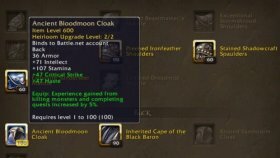 Initially, heirlooms cover the 1-60 range and will stop improving after that point — but you can upgrade your original heirlooms twice, once to level 90 and a second time to level 100, meaning you can gear up with heirlooms and stick with them until max level. With patch 6.1, it’s easier than ever to get a full set of heirlooms, even for new players, as they’re all sold for gold at vendors in major cities. However, the costs can add up: armor pieces cost 500 gold each, 1-handed weapons cost 650 gold, necks and trinkets cost 700 gold, and 2-handed weapons cost 750 gold for level 1-60 items. Upgrading them is pricier still: a level 90 upgrade costs 1000 gold for armor and 1200 gold for weapons, while a level 100 upgrade costs 2000 gold for armor and 5000 gold for weapons. Still, even at those prices heirlooms are worth getting whether you’re a level 100 looking to level a new alt or just getting started. We’ll walk you through what heirlooms are, where to get them, and how you can work around the initial high pricetag. Where can I get heirlooms? Heirlooms are now consolidated in a tab of the collections interface, alongside mounts, pets, and toys. If you’ve previously bought heirlooms on any character on your account, you’ll find them here — and if you want a heirloom on a new character, all you have to do is click on it in the heirloom tab to get a copy for yourself. This makes it a lot easier when you’re getting a new character started — they’ll have immediate access to all of your heirlooms, no matter what server they’re on or what faction they play as. 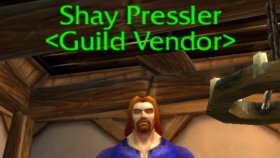 To pick up heirlooms of your own you’ll want to visit your heirloom vendor: that’s Estelle Gendry in Undercity for Horde or Krom Stoutarm in Ironforge for Alliance. 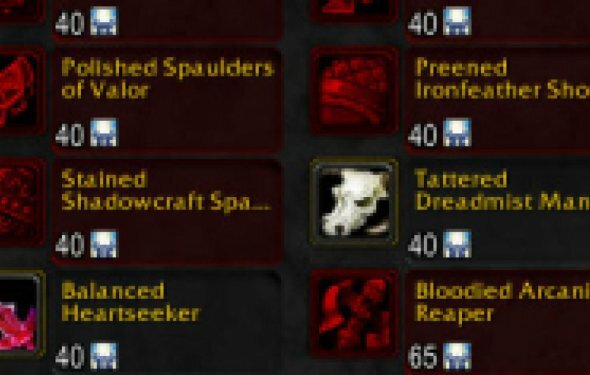 Both of these vendors sell the same heirloom gear — including weapons, shields, off-hand items, shoulders, trinkets, necks, and chests — and items to upgrade your heirlooms to level 90 and level 100. However, a handful of heirloom items — helms, cloaks, and legs — are accessed through guild vendors, who can be found in most major cities. These items have additional guild requirements, too: cloaks and helms require you to have friendly guild reputation, while legs require you to have honored reputation (and the guild to have the Working Better as a Team achievement). Though these aren’t hurdles for large, established guilds, that can put them out of reach for new players. Just remember: you don’t have to buy these heirlooms on the character you’ll use them on.